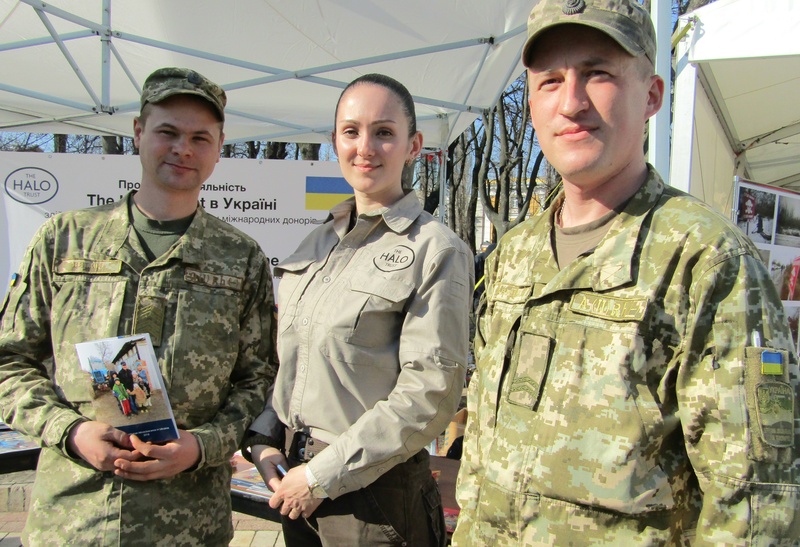 The HALO Trust's Asya Bolotova, and Ukrainian defense personnel, raise awareness of the dangers of land mines in in Eastern Ukraine. The HALO Trust, a non-profit organization, is responsible for removing debris left behind by war. In December 2005, the General Assembly of the United Nations declared April 4 as the International Day for Mine Awareness and Assistance in Mine Action. I noticed this commemoration on full display at Taras Shevchenko Park in downtown Kiev on a blissful spring morning. The event had added meaning in these parts, as the war between separatists and Ukraine’s army has only intensified in the Donbas region. In light of the tragic events, there remains a continued effort by various humanitarian organizations to provide assistance to protect civilians and refugees adversely affected by the dangers of war. Many of these organizations set up booths within the park. I also observed a plethora of explosive devices – like grenades – set upon tables, exhibiting how instruments of war are still being exploited in the battlefields. I spoke to Asya Bolotova, the operations assistant/mine risk education coordinator with the HALO Trust in eastern Ukraine. Bolotova explained to me how the organization works to remove debris, such as land mines, left behind by war. The organization has had a stellar track record of success worldwide as it has removed land mines and unexploded ordinance – otherwise known as LXO. According to its data provided, the HALO Trust destroyed over 1.5 million land mines, and over 11 million pieces of large caliber ordinance and over 200,000 cluster munitions. Close to 11,000 minefields have been cleared. Bolotova added that accredited journalists, and documentarians, often join their teams. “A lot of journalists are interested in our work, and they try to show what we do. [The dangers] are a very big problem in Ukraine, and we need a lot of people to know about this,” she said. The dangerous situation in eastern Ukraine is still bad. “[There have been] more than a dozen impact sites, in which children were woken from sleep with the terrifying sounds of artillery rounds crashing into their homes and neighborhoods. There [have been] many injuries,” Alexander Hug, the Principal Deputy Chief Monitor of the OSCE Special Monitoring Mission to Ukraine, assessed to my colleague Oksana Chelysheva in her report earlier this month. The conflict has led to a de-facto partition of Ukraine, and internal displacement of 1.6 million people while many people have fled across the borders, according to OSCE. In 2017, 480 civilians were killed. “The sides should aim at zero civilian casualties. They have the power and authority to achieve this objective if they want it,” added Hug. The Danish De-mining Group (DDG) who works under the auspices of the Danish Refugee Council, was another organization having their tent set up in Taras Shevchenko Park on International Mine Awareness Day. “We’ve been here since November, 2014 doing de-mining risk campaigns,” said Henry Leach, who heads DDG. “We are a part of Danish Refugee Council, who does a wide intervention concerning resettlement, legal assistance, and they do livelihood projects, and they do protection activities, as well. “Our mission here is really to protect civilians from the dangers of land mines, and unexploded ordinance – whether that be through providing information or through clearing the items themselves, or through working with the authorities to boost their capacity, and to provide assistance wherever is most needed,” he added. Henry Leach, who heads Danish Demining Group in Ukraine, with his colleague on International Mine Awareness Day in Kiev. In February 2015, DDG initiated Mine Risk Education projects with the key objective of community level awareness raising of the risks of mines and unexploded ordnance contamination, as reported on its website. Training of local trainers in Mine Risk Education (MRE), development of educational materials and public information campaign have been some of its initiatives carried out in the area. “No one will ever tell you that they will never need more funding, but Ukraine has slipped off the radar a bit in terms of donors, in recent years. [Nonetheless], we are seeing a bit more positivity… coming to the table, and providing more funding,” added Leach. Ordinary citizens throughout Ukraine often provide warm clothing, bed sheets, and hygiene items to those affected in the Donbas region through various relief agencies. On this April afternoon in Kiev, I certainly observed a heavy dose of idealism, pragmatism, and purpose coalesced by humanitarians who continue to provide hope to an otherwise bitter war that remains a long way off from being resolved.